The England Women’s head coach Craig Richards has selected ten uncapped players in his 20-player squad to face France in Carcassonne on Saturday, October 27th (KO 1.00pm BST/2.00pm CEST). 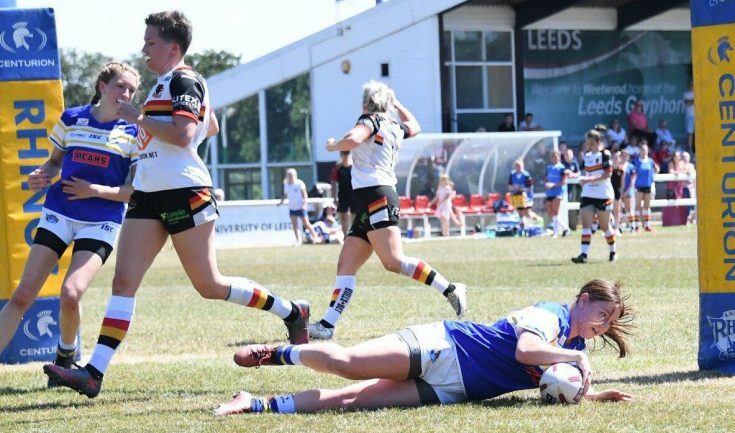 Among those gaining their caps are 16-year-old Caitlin Beevers, who made her debut for Leeds Rhinos in April this year. Caitlin scored in the Rhinos Women’s Challenge Cup final win against Castleford Tigers and made history when she became the first female match official to referee the Year 7 Boys Champion Schools Final at Wembley earlier this year. And Dannielle Anderson (pictured above) who moved to Leeds Rhinos from Oulton Raidettes at the beginning of the season. The award of a cap is the reward for a very successful season with Rhinos, who won the League Leaders Shield last week. Dannielle was also named the Coach’s Player of the Year. Rhinos will play Castleford for a place in the Grand Final on Sunday. Women’s Rugby league has shown huge growth and new interest in the last couple of years, we send congratulations to all those capped and wish them every success in France.